Evolution is a difficult idea; it deals with random, unlikely events, combined with vast lengths of time too enormous to comprehend. But the evidence of evolution is all around us - in the fossils of long-dead creatures that stumbled and fell along the journey of life, in the genes that made us, and in the relationships between all living beings, helping us to understand what makes them different and what makes them similar. 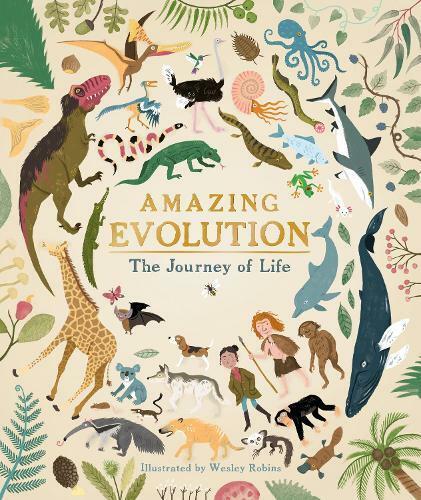 Amazing Evolution explores the incredible ways that evolution works, starting with the beginnings of life 3.5 billion years ago, all the way up to the walking, talking super apes that can speak to others on the opposite side of the world and even walk on the moon - human beings. Learn what makes a fish a fish, a bird a bird, and what makes some superstar creatures so special. Filled with fascinating facts, clever connections, and engaging explanations, Amazing Evolution will keep children enthralled for hours.